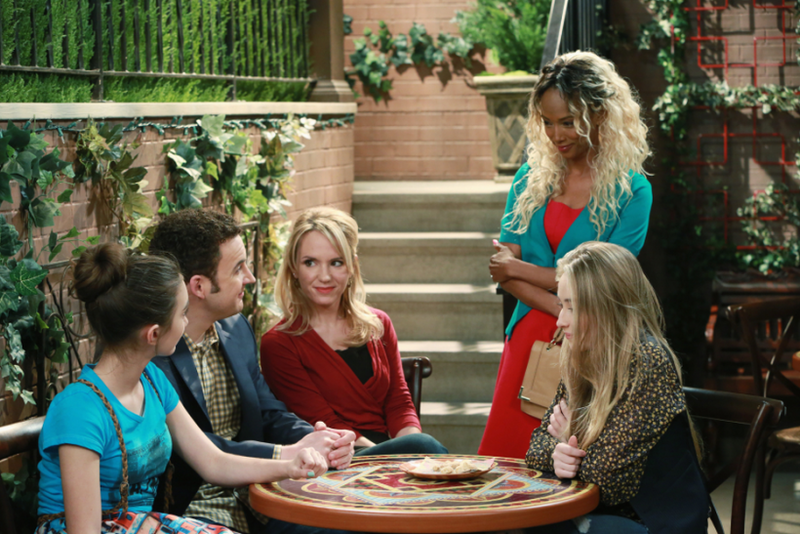 The Shawn and Angela “Boy Meets World” reunion finally aired on “Girl Meets World” Friday night. It’s been 15 years since the exes saw each other, but the connection between them was still there. However, a lot had changed in the time they were separated. Episode 9, “Girl Meets Hurricane,” jump-starts with Cory (Ben Savage), Riley (Rowan Blanchard), Maya (Sabrina Carpenter) and Shawn (Rider Strong) hanging out at the coffee shop. Maya and Shawn’s relationship is so adorable that even Cory is jealous of their connection. However, things take a turn when Maya asks Shawn to give her “fatherly advice.” Shawn doesn’t believe it’s his place, but after some pestering -- and a couple of chicken noises -- Shawn agrees to give her some advice. “I think you should dress differently,” he tells her. The advice makes Maya cry, but not because it hurts her feelings. Shawn and Maya continue to bond when they go shopping with Cory and Riley. But when Shawn spends a little too much on Maya, Maya’s mom, Katy (Cheryl Texiera), is not thrilled. She works hard to keep the lights on and doesn’t want Maya to get her “legs cut out from under her.” However, Shawn insists that he wants to be responsible for the fun stuff like this, and that it’s nice taking care of somebody besides himself. Maya has new hope after her shopping trip with Shawn, and the next day in school she learns a little bit more about hope through a lesson on Hurricane Katrina. It’s a lesson that Katy needs. When Shawn swings by the coffee shop, Katy warns him that he needs to stop being nice to her. Katy believes that Shawn is confusing his affection for Maya with her, and she’s not ready to get hurt again after her ex-husband left. Shawn’s confused by Katy’s outburst, and things only get more complicated when his ex, Angela (Trina McGee), shows up. “I need to talk to you,” she says, hugging him. Shawn’s shocked, and so is Katy. She awkwardly shakes Angela’s hand and tells her that Shawn speaks very highly of her. Katy ducks out to leave the two alone – but she ends up joining Riley, Maya and Cory to spy from outside the window. “I really missed you,” Angela tells Shawn. But Shawn’s not taking the bait. Angela reveals that her dad died while fishing and that she needed someone to talk to -- Shawn. However, she’s not looking to rekindle their relationship because she’s been married for four years to a military man. The news surprises Shawn, and he questions her about why she left him. “I wasn’t ready,” she explains. But after a while, she became ready -- and it was because of him. Shawn’s still confused about why she came to see him, and Angela reveals that her husband wants to have kids -- a thought that scares her. She’s nervous about becoming a mom because her own mother left, but Shawn promises her that she’ll be a great mom. It’s just the push that Angela needs, so she gives Shawn a push as well. Referring to Katy, she asks Shawn if she’s “the one.” Shawn immediately becomes nervous, unsure how to answer. But Angela’s not buying that as an answer. She tells him to let what they had “make you ready for something.” She leaves, but not before offering a warm smile to Maya and her mom. Later at the clothing store, Shawn offers to buy Katy an outfit. But Katy makes a counteroffer … and asks Shawn on a date. Shawn freezes, but fortunately he’s got his dad Chet (Blake Cark) by his side. Although Chet died during “Boy Meets World,” he appears to Shawn during tough moments in his life. He tells Shawn that Maya and her “screwball mom” care about him, and encourages him to take Katy up on the date offer. What Happened To Shawn And Angela On ‘Boy Meets World’?